Peak Extracts Five Ten Cartridge comes filled with some of the most strain specific, terroir authentic cultivars that I’ve tasted in recent memory. But before I get too far ahead of myself, it wasn’t that many hours since my plane departed from Portland, Oregon. I was out there, not as a journalist, but as a mixologist. This was an unexpected bit of work, and it came at a fine time because I hadn’t been to Portland, Oregon in many months. My last trip out there was amazing. Filled with a series of deep-dives into the periphery of the legal cannabis business. There was so much that I wanted to do, see, eat and smoke, BUT there just wasn’t enough time to see the people I wanted to see, (I’m sorry), nor was I able to get that sit down meal at Pok Pok. I did get take-out, and it was delicious with those wings leading the charge to my palate. Le Bernadin, New York’s internationally acclaimed four star seafood restaurant, was the location for a luncheon to celebrate the American Craft Council, sponsored by Balvenie Scotch Whisky. You see Klaus, like American Crafts are a finite resource. Klaus was asked to drink whiskey during the day! Or was it that fact that I was asked, and Klaus came with me? I’m not sure. But the opportunity arose to ask five questions that suddenly became four questions, yet Klaus, the soused gnome was so interested in lunch, he forgot the last one. But that’s another story for another day. You see Klaus, like American Crafts are a finite resource. High end craft (not roadside crafts) is a fine art form. In many ways, Klaus is the same. He was handmade! Many years ago as well! At any rate, Klaus was thirsty for whiskey and day drinking is his favorite thing to do.. next to drinking everyone else’s drinks of course. He got to meet Anthony Bourdain! Frosty weather is coming quickly and in keeping with his German heritage, Klaus has a fire burning in the fireplace to take the chill off the morning. Mornings in the old house are usually punctuated by the sound of crackling fires in the dining room fireplace. Comforting and warming, a nice fire is taking the chill off the air out in the garden. Although it’s still warm during the day, the mornings can be rather chilly! You’d be hard pressed to find an authority figure when it comes to cannabis cocktails. But Warren Bobrow, the author of Cannabis Cocktails, Mocktails and Tonics, doesn’t think that’s because the combination is a bad idea. He should know — he literally wrote the book on the subject. He’s a strong believer in a good cannabis cocktail. It’s just that everyone else (other than a few brave bar owners) is too scared to tackle the subject. There’s that, and the fact that making cannabis cocktails the right way — in a safe way that actually tastes good — is a lot harder than just throwing a couple nugs into a cocktail shaker. Luckily, Bobrow has it mastered, and it all started with a dream and a passion for quality cocktails and cannabis. Bobrow didn’t recently jump on the cannabis trend. He says he’s been enjoying marijuana since he was 13 years old, and has experimented with putting marijuana in food. He was a banker for 20 years, but has since become a notable person in the cocktail world with four books about cocktails. Then in 2012 he read about a cannabis-infused dinner at Robertas in New York City. He noticed something curious in the story: The food had cannabis in it, but no one touched the drinks. Today, you don’t know cannabis cocktails if you don’t know Bobrow’s book. But for starters, here are some of the most important things to know before experimenting with cannabis cocktails. Bobrow’s preferred method of extracting THC, the active ingredient in marijuana, is through a process called decarboxylation, or simply decarb. Decarboxylation turns THCA, a non-psychoactive compound found on live marijuana plants, into THC. To decarb, you heat the cannabis at 240 degrees for an hour (Bobrow uses a decarboxylation tool from Ardent that is microprocessor controlled). You get out what you put in. So put in the good stuff. “All of my craft cocktails and mocktails and tonics and things that I use in the book include the use of the highest-quality craft spirits someone can buy,” Bobrow says. “It’s very important to understand this is a psychoactive drug and too much can render the user impossibly couch-locked like I found myself once or twice,” Bobrow says. Luckily, Bobrow has done all the experimenting so you don’t have to. “The best advice I can give is balance,” Bobrow says, because everyone’s body chemistry is different. The results can be unpredictable, as a VinePair writer who drank weed wine found out. Bobrow’s cocktails utilize cannabis-infused bitters, cannabis cherries that he calls “greenish cherries,” and infused liquors. You don’t need 20 ingredients to make a good cannabis cocktail. Stick with the basics and infuse cannabis for the ideal cocktail. Bobrow is inspired by history. One person in particular stuck out to him: Milton Mezzrow, a jazz musician in the 1920s who sold weed to Louis Armstrong. He named a cocktail after him, the Mezzrow Cocktail. The cocktail is a mix of cannabis infused vermouth, 1 ounce of bourbon, aromatic bitters, and greenish cherries in a glass with crushed ice. Klaus and his Hemponaire Photoshoot! The age of cannabis cocktails has arrived—and if you ask writer and spirit brand ambassador Warren Bobrow, author of Cannabis Cocktails, Mocktails, & Tonics, it’s been a long time coming. The “Cocktail Whisperer,” as he has come to be known, has been experimenting with cannabis tinctures and infusions for decades, and is one of the first to publish a book detailing his recipes. And while many still view marijuana as an incorrigible vice, Bobrow’s is a much more academic and, at times, spiritual fascination. Who is the Cocktail Whisperer? Like most people in the cocktail industry, Warren Bobrow’s story is a bit of a meandering one. Originally trained as a saucier, his career began with a dish washing job at a restaurant in the seaside town of York Harbor, Maine. He eventually worked his way up to an executive chef position before turning south, starting his own fresh pasta business in Charleston, South Carolina in the late 1980s. They told me that America wasn’t ready for it yet, and I think in many ways they still aren’t. Bobrow had always been interested in writing, but by his own admission he didn’t know the first thing about it. Thanks to a connection through his previous employer, though, he got his first chance to prove himself in 2009. The craft cocktail movement was well underway by the time the Cocktail Whisperer came to be, but Bobrow found himself drawn to a relatively unexplored corner of the industry’s history: the apothecary shop. Not always the most reputable businesspeople (hence the archetypal “snake oil salesman”), these early pharmacists nevertheless played an important role in the development of many ingredients and recipes we take for granted today. The Mezzrole Cocktail, via Cannabis Cocktails, Mocktails, and Tonics. Used with permission, c/o Fair Winds Press. Perhaps his most famous product was Geritol, an iron supplement that was cited for false advertising that “amounted to gross negligence and bordered on recklessness,” according to the FTC. “He always referred to it as selling ice to eskimos,” Bobrow recounted wryly. It was, at least in part, this family connection that first piqued his curiosity about history of apothecaries. Rather than attempting to validate what was a pretty clearly unethical business, though, Bobrow has always viewed patent medicines as a manifestation of a much more ancient practice: traditional folk medicine. His first book, Apothecary Cocktails, explores a number of turn-of-the-century recipes and ingredients that have left a mark on popular drinking culture, as well as the contemporary bars that have sought to revive them. But even back then, cannabis as a cocktail ingredient was squarely on Bobrow’s radar. “When I wrote my first book, Apothecary Cocktails, I wanted to include cannabis in it, because it has such a long and storied history as a pharmaceutical. But my publisher wouldn’t let me. They told me that America wasn’t ready for it yet, and I think in many ways they still aren’t. These substances were used for years, and it was only because of the ‘drugs are bad’ movement that they’ve been erased from history. As public opinion and the political landscape shifted over the last half-decade, though, he began to feel that the time was ripe for an in-depth exploration of the intersection between cannabis and alcohol—long-time bedfellows in the form of tinctures and infusions in the medicine cabinets of yesteryear. Bobrow got in touch with his editor, who informed him that the publishing house was actually considering a cannabis project for future release. He scrambled to put together a book proposal in three days, and to his delight, they accepted it. One of the things Bobrow wanted to develop was a guide to the flavor profiles of different strains of cannabis—after all, the research that goes into drink development these days is far from trivial. But unlike alcoholic ingredients, he also had to consider the different psychoactive properties of each. “For example, I tried infusing Absinthe Edouard with a high-quality indica strain. It created this wonderfully lucid, translucent feeling. It also makes a great Absinthe Frappé,” he said, chuckling. The Dramatis Personae Cocktail, via Cannabis Cocktails, Mocktails, and Tonics. Used with permission, c/o Fair Winds Press. While the book has faced some backlash from anti-drug activists (and even a few cannabis proponents), it seems that Bobrow is sincerely concerned with ensuring that people enjoy his recipes responsibly. It seems like every other page of his book includes a warning about not overdoing it, and it’s one of the first subjects he brought up in our interview. “This book is not for beginners,” he stressed, “and I try to make that very clear throughout. They’re strong drinks, even though we did our best to minimize their strength. I don’t recommend them to people who are just looking to party—ideally, they’ll introduce medical and recreational users to the rich history of cannabis in the healing arts. Despite the fact that recreational marijuana remains illegal throughout most of the United States, Cannabis Cocktails has been a hit nationwide. And based on its reception at this year’s Tales of the Cocktail, the bartending industry is itching for more opportunities to put his recipes to the test. We don’t know what the future will hold, but if current trends continue, we wouldn’t be surprised to see a handful of other states joining Colorado and Washington in cannabis legalization this November. But it’s clear that no matter what, Warren Bobrow will be at the forefront, an apothecary for the modern day. I’m a huge fan of Manhattan-style cocktails; they make great aperitifs. This one is named after Milton “Mezz” Mezzrow, a jazz musician who lived in Harlem in the 1920s. And, as Mezz himself would have known, the term for a well-rolled cannabis cigarette was a “mezzrole”—so I just had to commemorate both man and medicine in this elegant cocktail. It combines cannabis-infused sweet vermouth, handmade cocktail cherries, and quality bourbon into a small, but well-formed, libation that’s deeply healing. When you’re infusing your vermouth, consider choosing a Sativa-Indica hybrid strain called Cherry Pie. It’s redolent of sweet and sour cherries, and it complements the toasty, oaky flavors inherent in the liquors. As for making crushed ice, it’s best to place the ice in a Lewis bag—a heavy canvas bag that’s made for the job—before whacking it with a wooden mallet or rolling pin. This recipe calls for Greenish Cocktail Cherries. Muddle the Greenish Cocktail Cherries with a wooden muddler or the handle of a wooden spoon, then top with the vermouth. Continue to muddle for 30 seconds to combine the flavors. Cover with the crushed ice. Top with the bourbon, then dot with aromatic bitters. Don’t have two; one should be more than enough. One Strong Drink With ‘Cannabis Cocktails’ Author Warren Bobrow! “What’s in the bottle is not what’s on the label,” says Warren Bobrow, handing me a small apothecary jar of amber-colored fluid. Inside is a top-shelf rum, he says, infused with high-grade marijuana — specifically, a strong indica-dominant hybrid known as Granddaddy Purple. Yet, despite containing such a notoriously aromatic additive, the liquor does not reek of dank weed. There is, however, a noticeable difference in taste: a pleasantly herbal, almost minty, flavor on the tongue.“Isn’t that delicious?” he says. Bobrow, 55, is the author of several cocktail books, including the highly regarded Apothecary Cocktails. 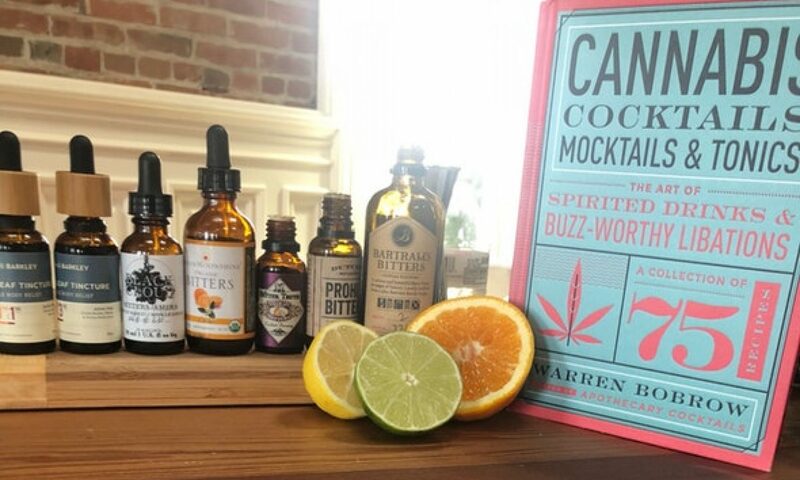 His latest is titled Cannabis Cocktails, Mocktails and Tonics: The Art of Spirited Drinks and Buzz-Worthy Libations. It’s the first of its kind — a collection of 75 recipes devoted exclusively to marijuana–spiked drinks. And to hear him tell it, the effort brings together two disparate cultural groups. We’re sitting outside in the courtyard at Roberta’s, the wildly popular restaurant in the artsy Brooklyn neighborhood of Bushwick. Bobrow has just finished up an on-air appearance for Heritage Radio inside the restaurant’s tiny in-house studio. But the setting is more than merely convenient, it’s apropos. Roberta’s famously hosted a “three-course, two-cocktail weed-heavy tasting menu” chronicled by GQ in 2012. “I really should fire one up just out of basic pretense,” says Bobrow. But we refrain, at least until leaving the premises. Though America is becoming more tolerant toward marijuana use, with laws in many places changing to reflect that, the issue is much trickier with regards to licensed establishments like bars and restaurants. Bobrow notes that the federal Alcohol and Tobacco Tax and Trade Bureau considers it illegal to infuse alcohol with cannabis, which makes the subject a nonstarter in a commercial setting like this. Any halfwit can dump a bag of dope into a bottle of hooch and create a very potent potable if he waits long enough. Bobrow’s handsome how-to manual instructs you on ways to treat cannabis like a true cocktail craftsman regards any other valuable ingredient. “I love getting stoned, like anyone else, but I don’t want to drink something that looks and tastes like mold,” he says. The book suggests ways to infuse cannabis into everything from absinthe and condensed milk to maple syrup and cocktail cherries. It even offers tasting profiles of several popular marijuana strains and recommendations on which strains pair best with which spirits. Like many culinary-cannabis enthusiasts, Bobrow is a stickler for decarboxylation, a technique to essentially pre-cook the cannabis in order to properly activate its psychoactive and otherwise therapeutic chemicals. The book details two methods to this end: the very fragrant approach of using a basic oven and a less odorous sous-vide option of boiling the stuff in a bag. One trick not mentioned in the book: Bobrow says you can even use a microwave. All you need is a microwave-safe container and an oven bag. The book also explains how to use lecithin powder, a common supplement found at most health-food stores, for an additional boost in any cannabis-enhanced concoction. “Lecithin is an emulsifier,” Bobrow explains. “It’s also brain food. It’s what your brain is built on.” One tablespoon of lecithin per cup in an infusion “supercharges” the cannabis, according to Bobrow. “It goes from 0 to 60 to 0 to 1,000,” he says. Klaus & I were on Heritage Radio!! Photos from the Albany Craft Show! !